Comino is a beautiful island with interesting geography. Jagged cliffs dominate a rocky wilderness which also gives home to coves, creeks and coastal caves as well as two small sandy beaches. Its most famous feature if the Blue Lagoon, a stunning cover with white sand where the azure waters are crystal clear. It is fabulous for swimming as it is roped off to prevent boats entering the lagoon and you can also swim over to the uninhabited islet of Cominotto and the rocky ledges around the cove are ideal for sunbathing. Peak-season facilities at the Blue Lagoon include public toilets, refreshment kiosks and deckchair and umbrella hire. The island is classified as a wildlife sanctuary and is blessed with many wild flowers and herbs, among them cumin, which gives rise to the island’s name in Maltese, Kemmuna. The air is often filled with the smell of the herbs, particularly wild thyme. The countryside is also home to St. Mary’s Tower which was built by the Knights in 1618. Having been a signal tower, an isolation hospital and a stable for livestock, the tower was fully restored in 2004 and the public can climb the steps to admire the beautiful views. There is also the St. Mary’s gun battery dating from the 17th century which too, has been restored. 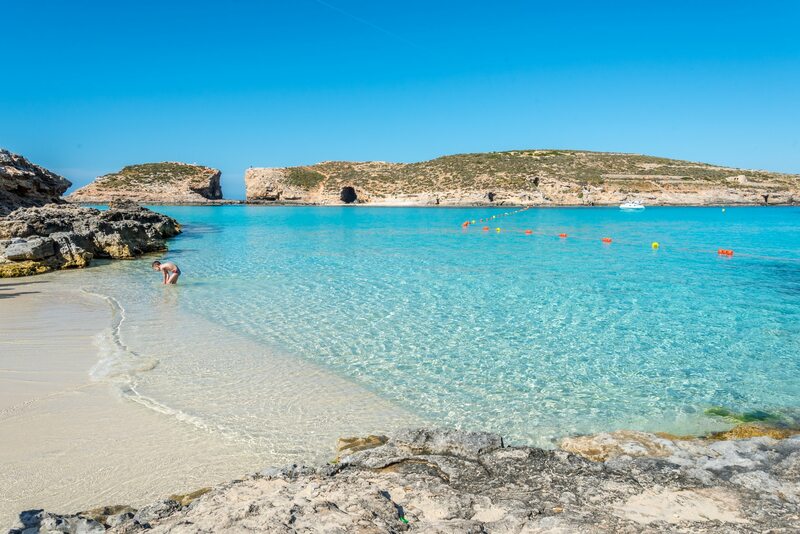 Comino is only 2 kilometres long and 1.7 kilometres wide, covering an area of 3.5 square kilometres and there are no tarmacked roads and very few cars. 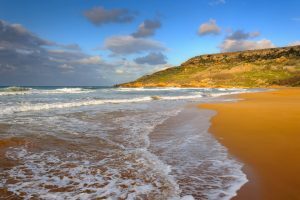 It is a tranquil place that offers a change of pace from Malta and Gozo and is a haven for photographers. Apart from that, take a look at our list of things to do in Comino. 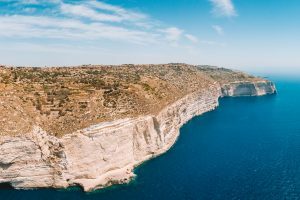 Is a day trip to Comino worth it when on holiday in Malta? Whether you want to leave Malta for a day to visit Comino depends on your motivation and the time of year. 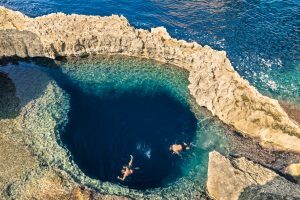 Although beautiful, it is not significantly different to Malta and Gozo, so the main reason to visit is the island’s biggest attraction, the Blue Lagoon. The Blue Lagoon is world famous and the time of year will influence your experience: In the peak season of July and August, it is extremely busy with tourists. To avoid the crowds, it is best to visit at other times, but swimming is not always possible (swimming period is June-October). If exploring the island is more of an attraction then too, it is better going outside the peak season; not because of crowds ticking the Blue Lagoon off their bucket list, but because it is extremely hot in July, August and September, and with little shade, walking the island is not much fun. Is it possible to stay on Comino? 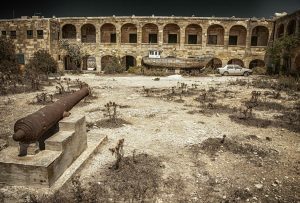 The island has just one hotel, unimaginatively called the Comino Hotel, and it’s located at San Niklaw Bay which is also the pick-up and drop-off point for the visitor ferries and tourist boats from Malta and Gozo. Although billed as 4-star, in reality it is probably below that standard. The hotel is reasonably priced and offers bright and airy air-conditioned rooms with balcony, simply furnished but well facilitated. 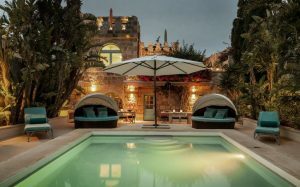 As well as a restaurant and bar, there are two swimming pools – an adult pool and kiddies pool, ten tennis courts, a boules pitch, a fitness room and a number of water sports. Sports available are windsurfing, diving and snorkelling. The two small sandy beaches are exclusively accessible to hotel guests. The hotel also offers bungalows in Santa Marija Bay, reached in two minutes from the main complex by a complimentary mini bus service. The bungalows are only 100 metres away from the bay’s sandy beach and also enjoy their own private rocky swimming area. In truth, there are probably insufficient amenities to warrant a long, lazy stay and also, not enough to do on the island unless your idea of a holiday is to not stray too far from your hotel. If you decide to stay in the Comino Hotel in peak summer season, you are advised to book at least six months in advance. 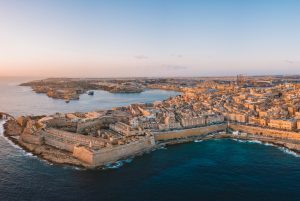 It is worth getting in contact with the hotel as its staff are happy to help with travel arrangements including airport transfers and the ferry service between Malta and Comino. To make the most of your stay, ask for a room with a sea view, a definite bonus for a small increment in room tariff. If you are a little more adventurous, the other option for staying on Comino is camping. There is just one campsite on Comino, in the north of the island. Camping pitches overlook the beautiful bay of Santa Marija. There’s a small sandy beach which gives easy access to the sea for good swimming and snorkelling. Campsite facilities include public toilets and a stone-built barbeque. No permit is required to camp on Comino. 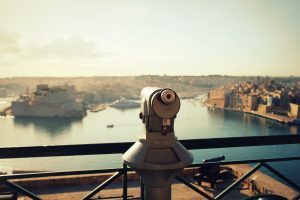 How to get to Comino? There are two regular ferry services to Comino. One service from Cirkewwa on the northern tip of Malta, and the other from Mgarr Harbour in Gozo. Both services land and leave from San Niklaw Bay on the northern side of Comino and generally, the crossing takes about 25 minutes. Fares are around the 10 Euro mark. Another ferry service is operated by the Comino Hotel to both Malta and Gozo. Please be aware that although open to non-residents, priority is given to hotel guests. During the peak season, there are boat trips to Comino from other favourite tourist places in Malta, such as Buġibba and Sliema. 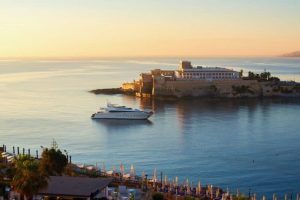 These crossings take longer than the scheduled ferry services and cost more, up to 20 and 25 Euro, but if you’re staying in one of these places, it is an easier option than catching a bus across the island to join a ferry.